The undisputed king of Sungura, Alick Macheso on Saturday night closed the 108th edition of the Harare Agricultural Show in style when he once again showcased his stage brilliance and ability to converse with any kind of audience as he riled and whipped a predominantly youthful, dancehall music loving auditorium into frenzy. Baba Sharo took to the stage after Ninja Lipsy who had with her an entourage of Panom*m* Munhu Riddim artists, namely Nutty O, Uncle Epatan, Bazooker and Enzo. Instead of accompanying Lipsy’s performance, the entourage robbed their female counterpart’s limelight to bring Glamis Arena into life and sing along mode. Enzo got hands high with his highriding Chiita Kwacho then came Nutty O with Boom Shelele. Bazooker and Uncle Epatan concluded the Panom*m* Munhu Riddim performances paving way for Macheso. 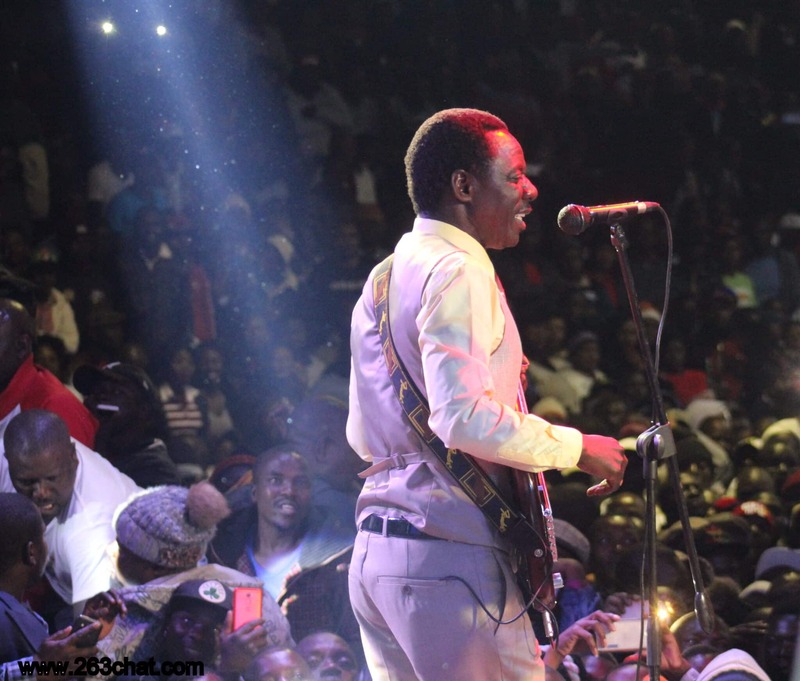 Following enticing dancehall acts, fans had to warm their ears to Sungura sound and as a result Macheso’s first song did not get good reception. However, thanks to his energetic band members and dancers, by the time 50 year old musician strummed his guitar strings to hit Ndakakutadzirei as his second song, audience’s limbs were already in motion to dance in tune. His guitar skills aided by good vocals, brilliant dancers and magnificent band members got a youths packed Glamis Arena appreciating the Sungura maestro’s talent. Usually when artists with hardly known music to “ghetto youth’s” ears are on stage, missiles will be an order of the day but Saturday night was a different case as all “ghetto youths” who were not up to speed with Macheso’s latest Dzinosvitsa Kure could not help but marvel at the well crafted display of art and performance.